Note: Rather than arrange the below by the usual bibliographic conventions -- i.e., by subject, genre, author name or etc. -- items are listed in chronological order, and include references to events as well as specific bibliographic citations. Independence dates for various island nations have been added to help link Oceania's political history with its literary output. The overarching goal is to illustrate the development of Pacific literary study & theory -- and, to a certain extent, the development of indigenous Pacific literature itself. Or rather, indigenous literature in English -- the below does not include, for instance, 19th-century Hawaiian language publishing, nor 20th- and 21st-century French-language writing produced by Pacific Islanders. Nor, for that matter, the growing body of modern vernacular writing. It is a work in progress, entirely subjective and by no means comprehensive. Rather, it is meant to survey touchstone moments and works in the field, along with occasional lesser-known items that may be of interest. Click on linked titles to view UH-Mānoa library holdings information. Florence "Johnny" Frisbie, a Cook Islander, publishes Miss Ulysses from Puka Puka. Frisbie, Florence. Miss Ulysses from Puka Puka: the autobiography of a South Sea trader's daughter. New York, Macmillan Co., 1948. Alistair Te Ariki Campbell (Cook Islander) publishes his first collection of poetry, Mine Eyes Dazzle. Jacqueline Sturm (Maori) publishes the short story "The Old Coat" in the journal Numbers. Tom and Lydia Davis (Cook Islanders) publish the novel Makutu. Believed to be the first English language novel by Pacific Islanders. Davis, Thomas R.A.H. and Lydia. Makutu. London: M. Joseph, 1960. Samoa (then known as Western Samoa) gains independence from New Zealand, and in the process becomes the first Polynesian nation to re-establish independence in the 20th century. University of Papua & New Guinea (later University of Papua New Guinea) founded; instruction begins in 1966. Ulli Beier is hired in 1968 as founding instructor for the UPNG creative writing program, the first of its kind within the Pacific. Elsewhere, John Dominis Holt (Hawaiian) publishes his first collection of short stories. Holt, John Dominis. Today Ees Sad-dy Night, and Other Stories. Honolulu: Star-Bulletin Printing Co., 1965. The first volume of Papua Pocket Poets is published. It will continue publishing irregularly through 1975. Ulli Beier serves as editor. (Note: Papua Pocket Poets has been fully "analyzed" by UH-M library catalogers. This means that you can search for authors published in the series by their personal name (use "Author Browse" in Voyager's Basic Search mode), by the title of individual poems (use "title keyword" or "title begins with" in Voyager Basic Search mode) or by the Series/Uniform title Papua Pocket Poets (also in Basic Search mode). Using the Series/Uniform Title search will bring up all of the individual titles from the PPP series that have been entered into the catalog, and is the best way to browse the library's holdings for this series. University of South Pacific founded. First issue of the journal Kovave published. Founded by Ulli Beier and published by the University of Papua New Guinea, it is the first journal of its kind devoted to art and literature in Papua New Guinea (then known as Papua and New Guinea). Fiji gains independence from Great Britian. University of Papua New Guinea graduates its first class. Among the graduates are Vincent Eri, whose book The Crocodile is generally considered to be the first novel by a Papua New Guinean; it was workshopped in Ulli Beierʻs creative writing course. Other notable writers who went through Beierʻs course include Leo Hannett, John Waiko, Kumalau Tawali, Rabbie Namaliu, Arthur Jawodimbari, John Kasaipwalova, Russell Soaba, Apisai Enos, Dus Mapun, Vincent Eri, John Kadiba, John Saunana and Siuras Kavani. Eri, Vincent. The Crocodile. Milton, Australia: Jacaranda Press, 1970. Beier, Ulli. Ed. Five New Guinea Plays. Melbourne, Aus. : The Jacaranda Press, 1971. South Pacific Creative Arts Society is founded in Suva, Fiji. Pacific Islands Monthly carries an SPCAS literary supplement in each issue from 1972 to 1975. Witi Ihimaera publishes Pounamu Pounamu, his first collection of short stories. Ihimaera, Witi. Pounamu Pounamu. Auckland, NZ: Heinemann, 1972. Papua New Guinea achieves self-government. First issue of Mana Annual of Creative Writing is published in Suva, Fiji, by the South Pacific Creative Arts Society. It will continue publishing through 1977. Albert Wendt publishes his first novel, Sons for the Return Home. Witi Ihimaera publishes his first novel, Tangi. Beier, Ulli, ed. Black writing from New Guinea. St. Lucia, Queensland: University of Queensland Press, 1973. Ihimaera, Witi. Tangi. Auckland, NZ: Heinemann, 1973. Wendt, Albert. Sons for the Return Home. Auckland, New Zealand: Longman Paul, 1973. Papua New Guinea achieves full independence from Australia; joins British Commonwealth. Wendt, Albert, ed. Some Modern Poetry from the Solomon Islands. 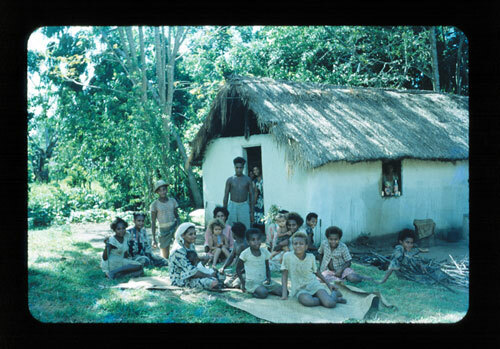 Suva, Fiji: Mana Publications, 1975. Solomon Islands achieves self-government as preliminary step toward independence. Vol. 1, no. 1 of the literary journal Mana Review is published in Suva, Fiji. [In 1977, the journal changed name to Mana , and continued publishing irregularly (most recent edition being Vol. 13, no. 1, 2001)]. The contents of both Mana Review and Mana are indexed in the Hawaii-Pacific Journal Index (HPJI). One of the first instances of Pacific literary criticism -- Albert Wendt's highly influential essay "Towards A New Oceania" -- is published in Mana Review. Wendt, Albert. "Towards A New Oceania," in Mana Review, vol. 1, no. 1 (Jan. 1976). pp. 49-60. Russell Soaba (Papua New Guinean) publishes his first novel. Soaba, Russell. Wanpis: A Novel. Port Moresby: Institute of Papua New Guinea Studies, 1977. Lulei, Dennis, E.J. Nash and John S. Saunana, eds. Twenty Four Poems of the Solomon Islands. Honiara, Solomon Islands: University of the South Pacific, Solomon Islands Centre, 1977 . Solomon Islands achieves indepdendence from UK. Maenuʻu, Leonard P. Who am I? : The Poetry of Leonard P. Maenuʻu. Honiara, Solomon Islands: USP Centre, 1978. Vanuatu achieves independence from France and Britian, which had jointly ruled the country since 1906 under the Anglo-French condominium. Vol. 1, no. 1 of the journal Contemporary Pacific is published; it continues to present. All issues are indexed in the Hawaii-Pacific Journal Index (HPJI). Full-text online versions of issues from 2000 through present are available to UH-Mānoa students, faculty and staff via the subscription database Project Muse (click here for access); full-text back issues from 1989 through one year before present date are available via Scholarspace, the Library's Open Access Initiative (click here to access). Sharrad, Paul, ed. Readings in Pacific Literature. Wollongong, Australia: New Literatures Research Centre, University of Wollongong, 1993. The Contemporary Pacific publishes Epeli Hau'ofa's seminal essay "Our Sea of Islands." Hauʻofa, Epeli. "Our Sea of Islands." in Contemporary Pacific, vol. 6, no. 1, Spring 1994. pp. 147-162. Click here to access full-text version online, via Scholarspace (Adobe PDF required). Makaʻa, Julian, Hilda Kii and Linda Crowl, eds. Raetemaot: Creative Writing from Solomon Islands. Suva, Fiji: Institute of Pacific Studies, The University of the South Pacific, 1996. Hereniko, Vilsoni, ed. "Pacific Writing Special," (Special issue) Wasafiri, vol. 25 (Spring, 1997). Hereniko, Vilsoni and Rob Wilson, eds. Inside out: literature, cultural politics, and identity in the new Pacific. Lanham, Md. : Rowman & Littlefield, 1999. Franklin, Cynthia, Ruth Hsu and Suzanne Kosanke, eds. Navigating Islands and Continents: Conversations and Contestations in and around the Pacific: Selected Essays. Honolulu: College of Languages, Linguistics and Literature, University of Hawaiʻi and the East-West Center : Distributed by University of Hawaiʻi Press, 2000. Waddell, Eric. "The emerging intellectual architecture of the Pacific." in Pacific Identities: Noumea symposium proceedings, 15-16 May, 1999. Canberra: Research School of Pacific and Asian Studies, Australian National University, . DeLoughrey, Elizabeth M. Routes and Roots: Navigating Caribbean and Pacific Island Literatures. Honolulu: University of Hawaiʻi Press, 2007. Perkins, Umi. "Pono and the Koru: Toward Indigenous Theory in Pacific Islands Literature." in Hūlili , vol. 4, no. 1 (2007). pp. 59-89. Hauʻofa, Epeli. We are the Ocean: Selected Works. Honolulu: University of Hawaiʻi Press, 2008. Epeli Hauʻofa passes away on January 11.